For six decades, Richard Avedon (1923-2004) brought fashion to life in the pages of Vogue and Harper’s Bazaar. His photos may have started out as advertisement for Dior, Chanel, or Versace, but they ended up as art. The images created by Avedon were fresh, energetic, and forever transformed fashion photography. Avedon Fashion 1944-2000 debuted in 2009 at the International Center of Photography (ICP) in New York, then Detroit and West Palm Beach. The MFA, in partnership with the ICP and The Richard Avedon Foundation, has now brought this traveling exhibition to Boston. 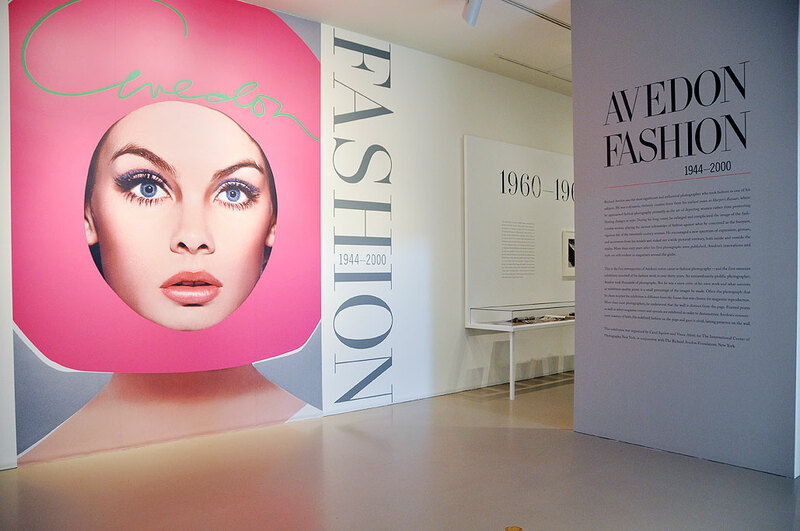 This major retrospective focuses on Avedon’s work in and contributions to fashion photography. Images are grouped by decades and presented to show his progression as a photographer, artist, and image-maker. This exceptional traveling exhibition from the ICP is the first comprehensive survey of Avedon’s fashion photography since 1978. What was interesting in an exhibit which brings so much of an artist’s work together in one place is the opportunity to see the progression in the development of an artist. We are always interested to see what an artist keeps and what they discard as they grow. Richard Avedon was only twenty-one when he published his first fashion photographs in Harper’s Bazaar magazine. In the 1950s, his vibrant style and dramatically staged images help redefine post-war Paris as the city of luxury, romance, and glamour that it was before the war. The 60s was a time of freedom and Avedon was at the front of the curve. His use of a model of color and photos of nudes broke barriers and sent shock waves through the fashion industry. Avedon did more than just shake things up with his unconventional models (Lauren Hutton, Anjelica Huston, Twiggy, etc…), he made them into celebrities. Avedon’s volume of work was huge. 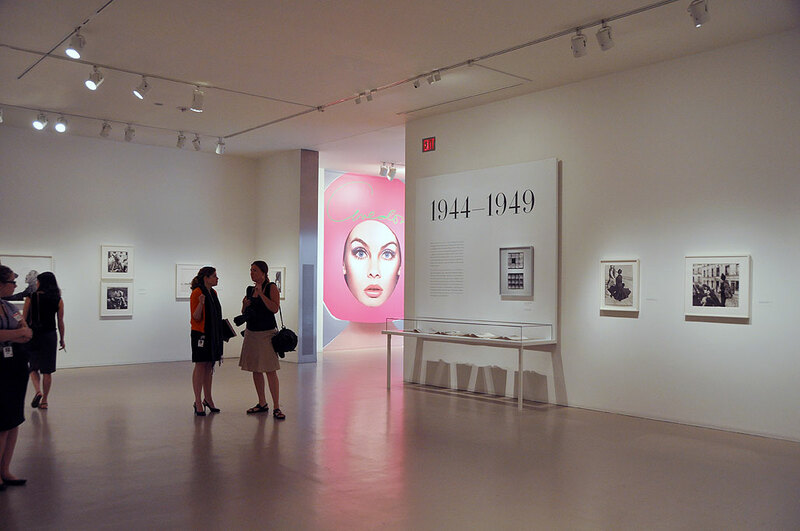 The exhibition highlights about 140 objects, including photographs, magazines, engravers’ prints, and contact sheets that span almost six decades of his successful career. While Avedon is most famous for his fashion photography, he also pursued his own work as a portraitist, photojournalist, and author of photography books until his death in 2004. His influences are still evident in portraiture and fashion photography today. We noticed some interesting things as we listened to the tour and made our way through the gallery. The thing about Avedon’s images is that they draw you in even if you are not all that interested in fashion. The clothes are always the main focus of his photos, but the images have more to them than just the clothes. He always seemed to capture something more. It is this extra bit that holds your attention. 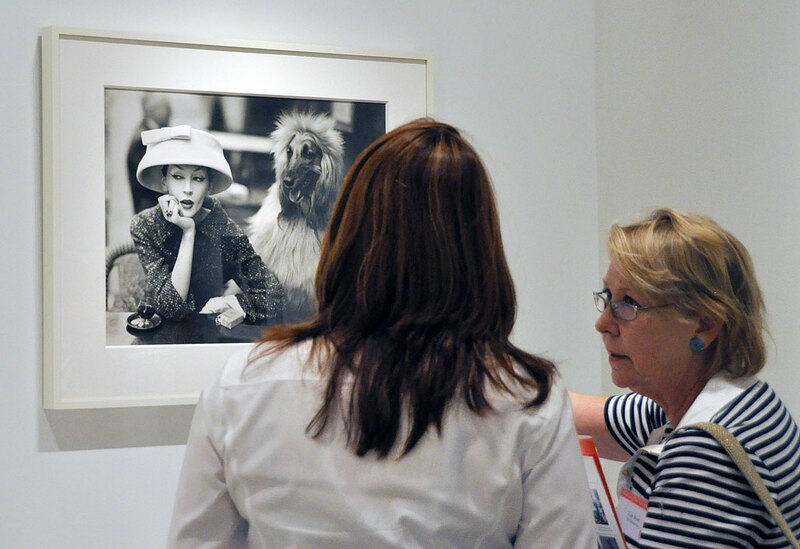 Some of our favorite Avedon images were the ones where he incorporated animals, especially dogs, in his images. They give the images a contrast that is both textural and subliminal. The wearing of clothing is uniquely human. We do it both for practical and modesty reason. As animals are totally comfortable in “their own skin,” it offers an interesting contrast to the haute couture being worn by the models in Avedon’s photos. “Avedon Fashion: 1944-2000” will be on view starting tomorrow and will run until January 17, 2011 in the MFA’s Foster Gallery. During Boston Fashion Week (September 24 – October 1), the MFA will have additional fashion-focused exhibits and programs. Highlights include talks given by Matthew Weiner, creator and executive producer of the hit TV Show Mad Men, and Don Ed Hardy, the tattoo artist whose designs inspired the Ed Hardy clothing line. The MFA is also planning a fun evening of runway looks by Saks Fifth Avenue, cocktails, and music; the screening of fashion films; gallery talks; and courses. Check with the MFA for more info!! !